What Can You Clean With Karcher K3? Karcher produces everything, from pressure washers for cleaning your home to municipal street cleaning machines. They have dedicated themselves to becoming a household name for outdoor cleaning equipment in Germany, France, the USA, the UK, Mexico, and others. We have prepared an unbiased Karcher K3 Follow Me review since it is one of their most economic choices for light cleaning jobs. We will test out the unit and share with you our views which will include the pros and cons, as well as other useful information about the product. 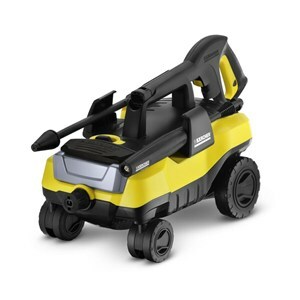 The Karcher K3 Follow Me electric pressure washer is a handy compact machine that provides 1800 PSI at 1.3 GPM. While the output isn’t that high, it is just enough for your everyday needs. The total cleaning power of this unit is 2340. We tested it out on a few different surfaces and the results were overall satisfying. The K3 model was designed to be compact and easy to use, which it certainly is. The unit itself weighs only around 16.3 pounds! The fact that it’s mounted on 4 wheels and not the standard 2 makes it easy to pull around your yard while cleaning. Because of its small design, it easily fits into any garage or shed. The unit comes with a 35-foot power cord and a 15-foot high-pressure hose which allows you to cover an area of 7500 square feet. K3 Follow Me doesn’t use the standard nozzles that you mount on the top. Instead, you are supplied with 2 special Karcher wand attachments and a pressure output regulator that lets you adjust the spray. Because of the design of the unit, only Karcher proprietary parts can be used on it. The Dirtblaster spray wand shoots a focused circular spray which allows for deep cleaning. While using it, we did see a noticeable power increase while cleaning grime on the driveway. The Vario Power Spray wand lets you control the pressure by twisting the barrel of the wand. This way you can change the power output while cleaning. Karcher K3 Follow Me saves you from stopping and changing the nozzle tips – all you need to do is twist the wand to get the desired pressure. This means that you can safely clean various surfaces in one go. The K3 Follow Me also has an onboard detergent tank for all your cleaning agents. It also sports a non-corrosive, durable and maintenance-free N-COR pump. To make sure your pump outlasts its warranty, all you have to do is prepare it for the winter, which is explained in detail in the user manual. The model is fairly easy to set up, it shouldn’t take you more than 10 minutes to correctly attach all of the parts and start cleaning. The Karcher K3 Follow Me pressure washer comes with a standard limited warranty of up to 2 years. However, standard attachments and accessories are under warranty only for 90 days – this is above the industry standard. Karcher has dedicated itself to building a reliable customer support service. If your unit fails for some reason, you have 2 choices. You can either contact them by email and then take your unit to one of their approved service centers, or you can use their “rapid exchange program” which allows you to replace the unit much faster. With this particular model, you can clean most types of dirt, mud, grime, mold, oil, moss and even rust. This unit will struggle to get rid of dried-in oil on your driveway and some heavier stains. You can clean your RV, car, house, patio furniture and even your windows. Just be careful around fragile surfaces, and make sure to use the Vario wand for anything you think might be breakable. It is a compact, easy to store, light-weight pressure washer, which is suitable for your cleaning needs around the house. The maintenance-free pump means you won’t be fiddling much to keep your machine running properly. Also, the price coming from Karcher brand is pretty easy on the eyes and wallet, as well. Since Karcher uses proprietary parts, you won’t be able to attach parts from other companies and you are forced to deal with their customer service agents if your machine breaks down. If any of the attachments or accessories break, you need to replace them with Karcher originals. Also, it doesn’t do the best job of cleaning oil or rust that has been around for a long time. If you are looking for a cleaning solution for simple, residential needs, then this would be a good investment to get rid of the dirt around your home. But, since it is meant for small to medium cleaning jobs, prolonged cleaning with this model isn’t recommended. After all, all residential pressure washers are intended for occasional use. It is very mobile and offers a lot of versatility with 2 included attachments. Also, if you like low maintenance and plug-and-play design, then the K3 Follow Me would be a good choice for you. We hope we have tackled all the important points in our Karcher K3 Follow Me pressure washer review. If we haven’t, feel free to write your questions in the comments below, and we will readily respond.